Fisherman's Loft is a newly completed first floor apartment in this block of four, right on the harbour at Mullion Cove, Cornwall. Adjacent to the coastal path with cliff top walking right from your front door if you are feeling energetic. Alternatively you could just relax and enjoy a glass of wine on the balcony... the choice is yours. Entered from the rear of the property up a short flight of stone steps, the quality of the property is immediately apparent with its wooden floors and fresh decoration. The double bedroom is well appointed with a 4’6” bed, bedside tables and lamps, and has glimpses of the harbour, the single room has a full size single bed with bedside table and lamp, and a chair. Being dual aspect, the living area is bright and airy giving fantastic views of Mullion Harbour, the cliffs and Mullion Island out in the bay. The access to the balcony is from here, with enough space for a couple of seats and a table for your glass, you can sit and watch the world go by while you wait for the glorious sunset. Kitchen is well-equipped with electric oven with ceramic hob and extractor over, microwave oven, washer dryer and fridge with a freezer compartment. The lounge has comfortable seating, LCD TV with Freeview and DVD player, and a wood burner for those colder evenings out of season. Rental includes bedlinen, towels, electricity, central heating, Wifi and the first basket of logs for the wood-burner. Regret no dogs and no smoking. Outside is parking for one vehicle. Short Breaks with a minimum of three nights may also be considered, please phone with your requirements. Also see property number 443 - Pat's Den, 509 Tregwyn, 510 Tremellin. 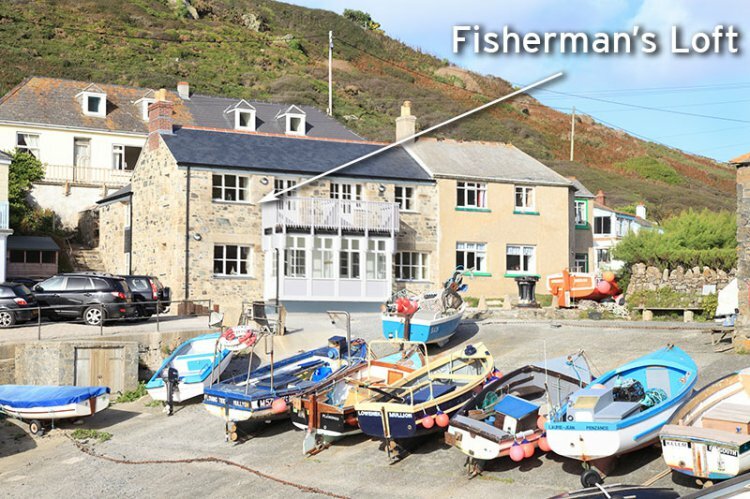 The cottages below are located on the same site as Fisherman&apos;s Loft.